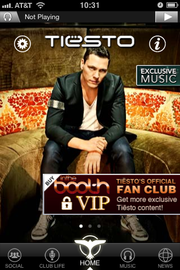 Tiësto announced the worldwide release of his Tiësto App for iPhone and iPod touch, available now on the App Store. To celebrate the new app, Tiësto is also re-launching his Tiesto.com and InTheBooth.com websites. Developed by Penté Group alongside Tiësto, the Tiësto App allows users to stream Tiësto’s music as well as his weekly Club Life podcast using a custom Tiësto music player.